Pack containing 20 quality ceramic disk capacitors , 300pF, 50V 5%. Great sma.. Pack containing 20 quality ceramic disk capacitors , 0.001uF 50V 5%. 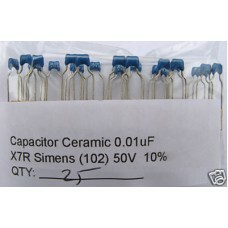 Great small p..
25 capacitors pack , 0.001uF 100V 2% Ceramic Capacitors (also known as .. Pack containing 20 high quality ceramic disk capacitors , 0.0022uF 50V 5%. Gr.. Pack containing 20 quality ceramic disk capacitors , 0.0039uF 50V 5%. Great small .. Pack containing 20 quality ceramic disk capacitors , 0.0047uF 50V 5%. Great small profi.. Pack containing 20 quality ceramic disk capacitors , 0.0056uF 50V 5%. Great small .. Pack containing 20 quality ceramic disk capacitors , 0.015uF, 50V 5%. Great s.. Pack containing 25 quality ceramic disk capacitors , 0.01uF, 100V. (also know.. Pack containing 20 quality ceramic disk capacitors , 0.01uF 50V 5%. 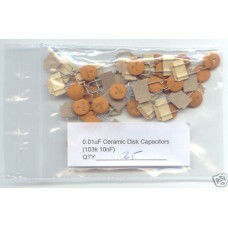 Great small pr..
25 capacitors pack. 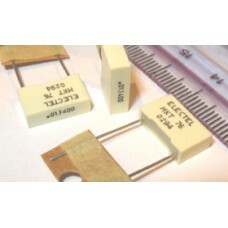 Metallised Polyester Film MKT, 0.01uF (10nF)..
25 ceramic capacitors pack, 0.01uF 50V X7R, 10% (also known as 10nF o.. Pack containing 20 quality ceramic disk capacitors , 0.02uF 50V 5%. Great small pr.. Pack containing 20 quality ceramic disk capacitors , 0.047uF 50V 5%. 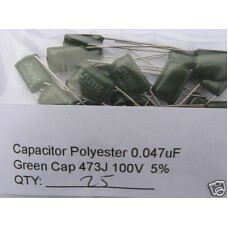 Great sm..
0.047uF (47nF equivalent or 473J ) 100V Green Polyester Film Capacitors. 25 capacito..